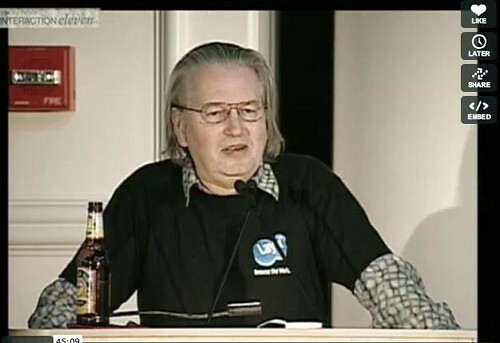 Conference organizers can be certain of one thing, Bruce Sterling is never short of a point of view and he always has a perspective that forces us to look at our reality in a new way. A few weeks back, Bruce was the closing speaker at the Interaction Design Association’s conference held in Boulder. The whole talk is worth watching, but for those of you how are time pressed, I will share some of his soundbites. He was keen to make the point that user information was a good thing, but being ruled by it was not so great and he pointed to his experience as a novelist. He encouraged interaction designers not to idolize their users. Another of his perspectives was on the problem that research makes us want to deliver perfect solutions that satisfy all users. His big problem was you’ve got to use common sense- “15% of your users aren’t any good” and “10% of the population is mentally ill, you should do the opposite of what they suggest”. Sterling had an interesting perspective about design morality- while novelists like swimming in the issues that surround morality, designers don’t go anywhere close to capturing it or understanding it. He highlighted the contemporary issues around terrorism, piracy and Wikileaks as being surprisingly absent from design discourse. He was keen to talk about death as the key issue surrounding us and that while death is absolute, it’s being defined by the media in different ways. When we think about morality, we don’t think it through. We notice the suicides of Chinese electronics workers, but we somehow don’t register the deaths of coal miners who are providing the power for the factory. He contrasted our lack ability to face death with Steve Jobs and identified it as his source of brilliance. Having a way of seeing the world is critical. The fact that interaction designers define their role as deconstructing reality and interactions into events and time is a powerful and different lens to see the world through. Seeing a chair, not as a “frozen set of relationships”, as one author had stated, but as “a series of interactions” was, a grown-up observation. Overall, Sterling was complimentary about the world of interaction design, but encouraged them not to lose their souls and not to get too slavish to the needs of their users. Interesting stuff comes from not-conforming, allowing surprise to enter in and re-defining current expectations and experiences.